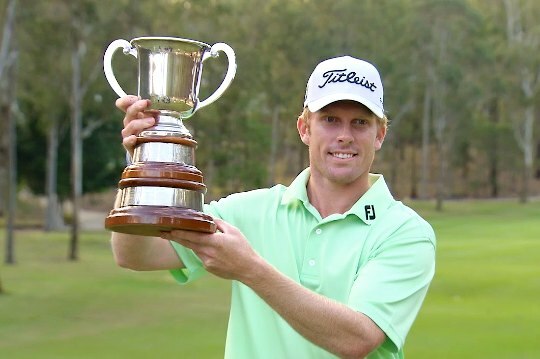 Four birdies over the closing six holes has allowed Queensland’s Andrew Dodt to claim a come from behind victory in the Isuzu Queensland Open at Brookwater Golf and Country Club outside Brisbane. The wild weather of the opening rounds made way for glorious conditions over the weekend and the players responded with some hot scoring, headed by Dodt. The former European Tour winner started the final round six shots behind the lead held by South Australian Tom Bond, but fired a five-under par 67 for a 7-under total to win by two strokes over Bond. Dodt’s familiarity with the layout from his amateur days was a key to putting in such a good performance this week. This was Dodt’s first victory since winning the 2010 Avantha Masters on the European Tour and Asian Tour. Bond needed a birdie on the difficult 18th to force a playoff but ran his attempt by the hole and missed his returning par putt to finish at 5-under 283 in outright second position. Tying for third at 3-under was the group of Matthew Griffin (VIC), Cameron Smith (QLD), Anthony Brown (VIC), Jake Higginbottom (NSW) and Michael Long (NZ) while Kade McBride made it a Queensland double by taking out low amateur honours, finishing tied for 8th with Brett Drewitt at 2-under. After a week’s break, the PGA Tour of Australasia will resume with the $140,000 South Pacific Open in Noumea, New Caledonia from September 10 – 13 where defending champion Andre Stolz is expected to return from a long layoff with injury.